These black polypropylene smooth caps feature an HS5-6F SFYP universal induction liner that reads "Sealed for Your Protection" on the top. 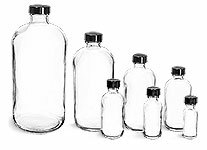 These clear straight sided jars come with black polypropylene caps with foam induction liners. These liners create a tamper evident seal for your product by applying with an Induction Cap Sealing System. These plastic jars could be great to package products such as vitamins, medications, spices, and more!